The rains are here and though it never actually becomes very cold in Mombasa, my relatives in Nairobi are complaining about the cold. Rainy season means cold weather, flus, coughs etc. What better way to feel warm than to have a nice hot soup. Leeks are at their best at the moment, very crunchy and tender. I decided to make some leek and potato soup. It has been eons since I had some leek and potato soup. Thought I better make it before I actually forget how it tastes. Simple to make, nutritious and I gave it a wee bit of an indian touch to it. So all those who are feeling cold, get into the kitchen and make some hot soup. On second thoughts, you don’t have to wait for the rainy season to make any sort of soup. They are great tummy fillers, good to have as a snack before dinner or have some for lunch. Trim the leaves and the roots from the leeks. Wash them thoroughly to remove any soil. Cut into big chunks. I also added a bit of the tender green part. Peel the garlic and chop it into big pieces. Peel, wash and chop the potatoes into chunks. Heat oil and butter in a deep pan over medium heat. When the butter melts, add the chopped leeks, potaotes and garlic and stir fry for 1 to 2 minutes. Lower the heat and cover the pan. Let the vegetables ‘sweat’ for 5 minutes. Add 2 cups of water and cover the pan. Cook overmedium heat for about 5 to 10 minutes or till the vegetables are cooked. Let the mixture cool a bit and then put it all in a blender. Liquidise to get a smooth puree. Pour the puree back into the pan. Add milk, salt, chilli paste and pepper and let it become hot over medium hot. Can add a dash of cream before serving. If you find the soup too thick then add a little bit more of water or milk. 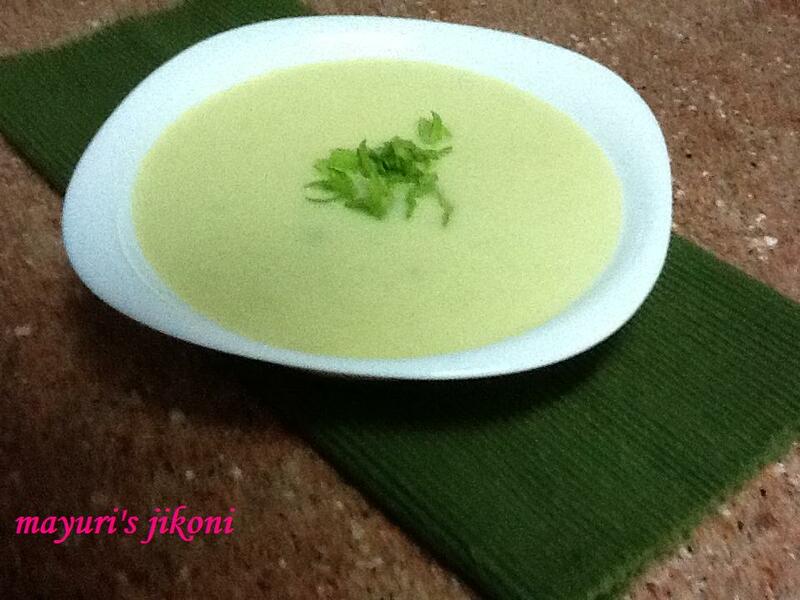 If you want a rich creamy soup, add ½ cup single cream and ½ cup of milk. Leave a few pieces of the cooked leek and mix it with the puree if you like. If you use stock instead of water, then you will need less salt. To make quick croutons, cut bread into cubes. Heat some butter or olive oil in a wide pan. Add the bread cubes and herbs and keep on stirring till they become crunchy.